We got to Shark Valley by dawn, and rode our bikes into the park. Right away Nancy saw this red-shouldered hawk (Buteo lineatus) swoop down to the empty parking lot and pick up a snake. It then flew up onto a nearby branch to eat it. It didn't seem to mind us getting close enough to get some good pictures. 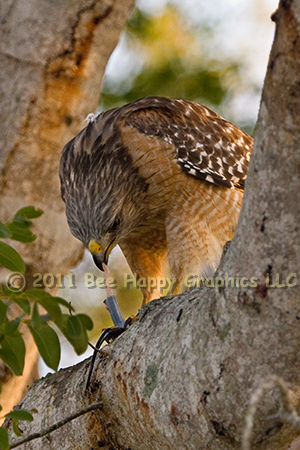 The hawk peeled back the skin and devoured the snake in no time. Photographic details: Canon EOS 30D camera w/ EF 100-400mm f/4.5-5.6L IS USM lens set at 235mm. Flash was not used. Camera was set for 1/160 sec on shutter priority with no exposure compensation. Aperture was f/5.6 at ISO 1600. Fine Art Paper 14" x 11" 15" x 111/2"
Canvas N/A 181/2" x 14"